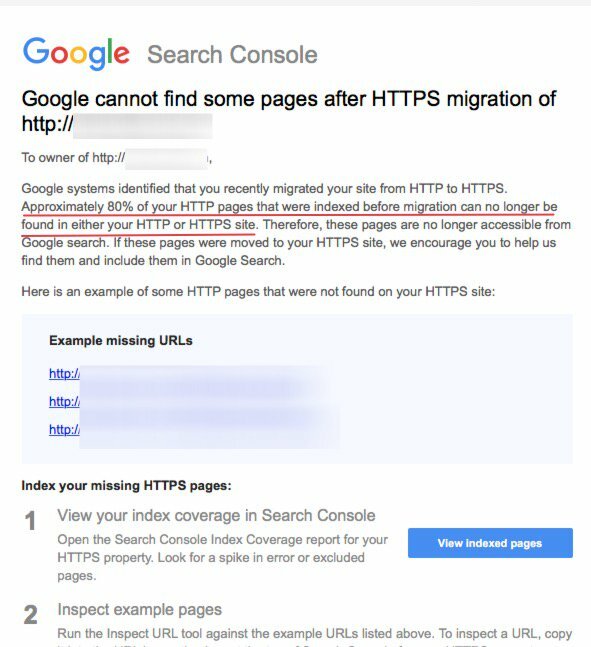 Google systems identified that you recently migrated your site from HTTP to HTTPS. Approximately 80% of your HTTP pages that were indexed before migration can no longer be found in either your HTTP or HTTPS site. Therefore, these pages are no longer accessible from Google search. If these pages were moved to your HTTPS site, we encourage you to help us find them and include them in Google Search. Google's John Mueller confirmed this and said "A lot of https migration problems come from bad or incomplete migrations, we're trying to help folks when we spot these issues. Hope this kind of heads up is useful!"